For many of us, childhood was associated with large back gardens, mostly lawn, with lots of space to play. Unfortunately, with the pressure on land, many gardens these days are getting smaller and smaller. For designers and landscapers this brings additional challenges to overcome. Probably the biggest challenge in a small garden is getting the design brief to fit the space. By that I mean clients may see that they have only a small space to work with, but they still want an area that can have multiple uses. Prioritising the uses, and giving a hierarchy to them, will help resolve what are the most important criteria for the design. Hopefully at this point you will be able gently suggest that a better, more effective design will be achieved when there aren’t competing calls on the space. Small gardens are usually ‘one-take’ affairs. That means that the viewer sees all or most of the garden in one view. From this follows another important design principle – each plant must earn its keep at all times of the year. With no where to hide, all plants have to have 4 seasons of interest. So consideration of plants means that a brief season of flowers followed by months of drabness or seasonal dormancy might rule them out in favour of something less spectacular, but interesting all year round. As most of the planting will be visible together, simplicity is the key, reducing the number of different plants to as small a number as possible. It is even more important in small gardens to gain the advantage of fluency by planting numbers of the same plant, rather than dotting a riot of different plants in the space. This is often a tricky thing to negotiate with a client, as they may have a list of favourite plants that they want included. Perimeters become very important in small gardens. It is often tempting to try to maximise floor area by using up most of the available area with hardscaping, relegating the ‘garden’ to a small band of growing space along each boundary. This highlights the smallness of the space, and reinforces the feeling of being constrained. Cutting across the space, using shapes that contrast with the perimeter help break down the feeling of ‘being in a box’. Using the diagonal (the longest line in a small garden), avoiding the square-within-a-square look, and using shapes that push out against the boundaries help overcome the visual constraints. In a small space it is also crucial to consider the vertical planes, both in the hardscaping and the planting. In smaller spaces the depth of the garden is exaggerated, so changes of levels, both of the hardscaping and the planting, help breakdown the relationship with the boundaries and the ground area. Where possible, vertical planes should be planted. In small gardens this usually means using climbing plants, though recently the craze for vertical gardening has meant that there is an alternative (though for me the jury is still our on the long-term viability of a long of vertical gardens). Consideration also has to be given to the upkeep of the garden. A small garden usually has little or no space for the storage of gardening equipment, so how much maintenance, and who is going to do it, is an important consideration in the design process. I’ve sometimes seen turf laid is tiny back yards. Where is the lawn mower going to live? In a small space, do you want to lose valuable space to a shed just to keep a lawn mower? Like everything else, textures are important in small spaces. Using textures to contrast will break up the space and give more visual interest. As most of the hardscaping is going to be space that will be used, thought should be given to using contrasts in texture as well as changes in levels to give an added sense of depth and dynamism to the garden. 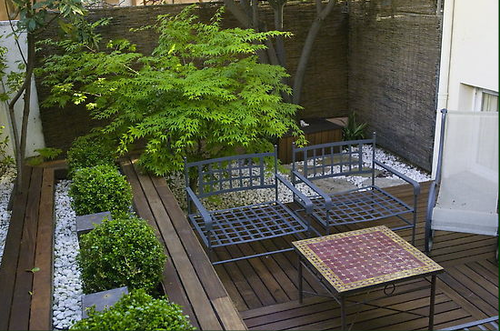 Small space garden design is certainly a challenge, but for some designers it is their favoured format. Well designed, a small garden can be an amazing oasis of beauty that belies the physical parameters of the garden and creates an impact out of proportion to is size.